Recent research by Montgomery shows that not only are high-quality businesses, running ahead of their intrinsic value. So, too, are the largest names on the ASX, which means long-term investors should approach this market with a degree of caution. Recently, we asked the question: is this problem more acute in respect of high-quality businesses, or is it spread more evenly across the quality spectrum. To try to put some data around this, we did some indicative analysis as follows. We took two portfolios – one an equal weight portfolio comprising of the highest quality companies we can see in our investment universe, and the other a capitalisation weighted portfolio of the largest names in the Index. We estimated the average intrinsic value of each portfolio using an automated valuation tool, at quarterly intervals going back ten years. View the full article for my observations on the results. The results of the analysis are set out in the chart below. 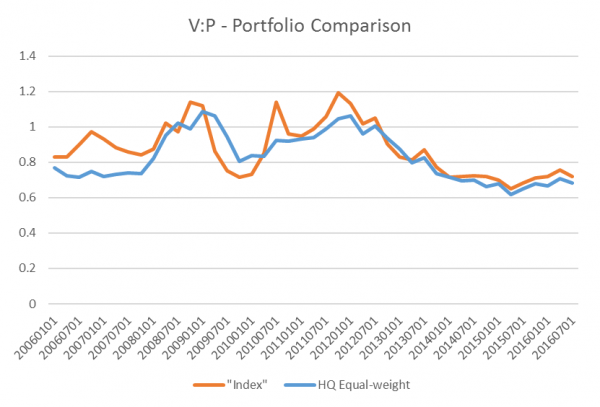 Valuations for both the “high quality” and the “Index” portfolios appear – unsurprisingly – stretched at the moment. The ratio of value to price is about as low as it has been over the past ten years. More interestingly, this problem seems to be affecting high-quality businesses in a similar way to other businesses. In view of this, we may need to refine our complaint somewhat, to say that it is hard to find businesses of any quality trading at attractive valuations at the moment. There is a small element of glass half full here, in that there is no indication that high-quality businesses are poised for relative underperformance. However, whichever way you look at it, there seems to be a good case for long-term investors to approach the market with a degree of caution.